Meet Our Caring & Compassionate Veterinary Team! Meet the Veterinarians and the all important Team of Guildford Animal Hospital in Surrey. Each Team member is dedicated to providing the utmost care for each and every pet we meet. Dr. Cathy Gies was born and raised near Calgary, Alberta and received her BSc in Biology from the University of Calgary, later returning there to complete her Doctorate of Veterinary Medicine in 2013. Dr. Gies started working with people and their pets in veterinary hospitals when she was just 13 years of age and it has been her passion ever since. After working for several years in a busy practice in Calgary, she purchased Guildford Animal Hospital with her partner, Dr. Dave Rubenstein. Since working in Surrey, Dr. Gies has quickly become known as one of the best veterinarians in the area. She always takes a great deal of time with each client and pet to ensure that the best care is always provided. Her clients come to see her from as far away as Vancouver, Kelowna, and even a few have followed her from Calgary. Dr. Gies is the primary dentist at our practice and she is passionate about all the pets at Guildford Animal Hospital having clean, healthy and pain-free mouths. She can often be found discussing preventative dental care, pulling a tooth to relieve the pain of a sore mouth or assisting our technicians with a dental cleaning. She is also known for her great care of our geriatric patients – ensuring that their lives are of the greatest quality for as long as possible with regular, thorough check ups. Cathy shares her home with a standard poodle named Dante, Neiman the black cat, a lovebird named Chaparral and Sadie, a cockapoo. She and Dr. Rubenstein are enjoying their new home in British Columbia. Dr. Lisa Yee has always had a passion for animals since she was young and she was able to realize her dreams and chase a career path that seemed like such a natural fit. She was born and raised in Vancouver, B.C. and completed a Bachelor’s degree in Animal Biology from the University of British Columbia in 2011. During her time as an undergraduate student, she started working as a veterinary assistant to get a better feel for the field of veterinary medicine. From there, she went on to complete her veterinary degree at The Royal Veterinary College in London, England and graduated in 2017. She really enjoyed the experience she had being abroad and being able to see how veterinary medicine differs between countries but in the end, she decided to come back home to settle down and start her career. 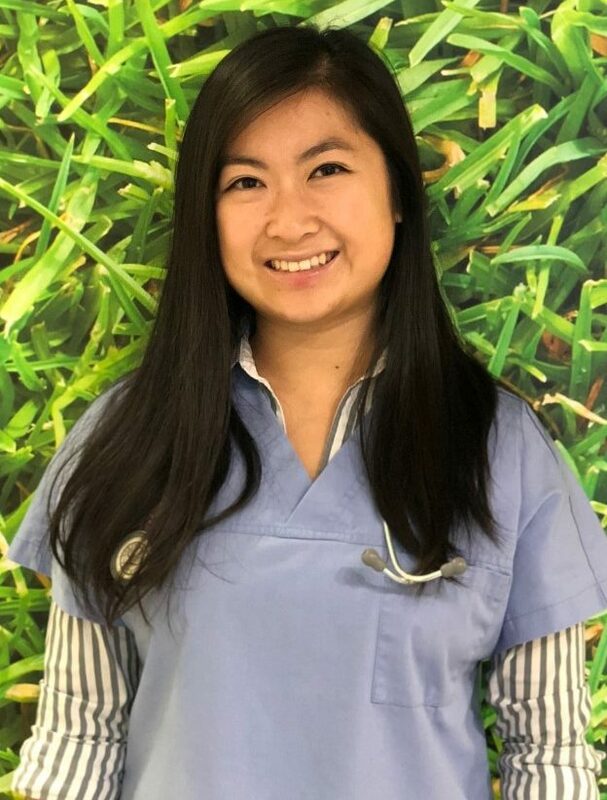 Dr. Yee had been practicing at a couple of small animal practices prior to joining Guildford Animal Hospital and is very excited to be a part of our team. As a veterinarian, she prides herself in being able to provide excellent standard of care for her patients. 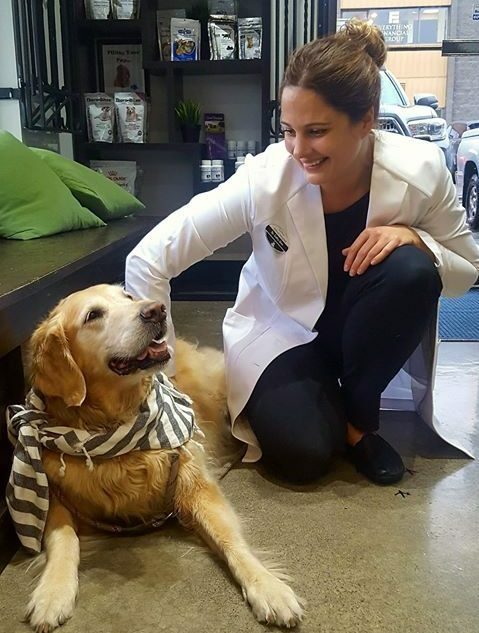 She truly values the relationships she has with her patients and their owners -- a relationship that is built on compassion, honesty and trust. In her time in practice so far, she has developed a passion for internal medicine and hopes to continue building on it. In her spare time, she is at the beck and call of her two cats, Cheddar and Blair. Cheddar was a rescue whose mother was a stray and she is now queen of the household. Blair was a recent adoption who started off as one of her patients and he was just too lovely of a cat for her to let him go back to the shelter. She hopes to continue growing her fur family and providing the best possible care for her patients. Dr. Dave Rubenstein was born and raised in Toronto and received his BSc in Biology from McGill University in 1994. 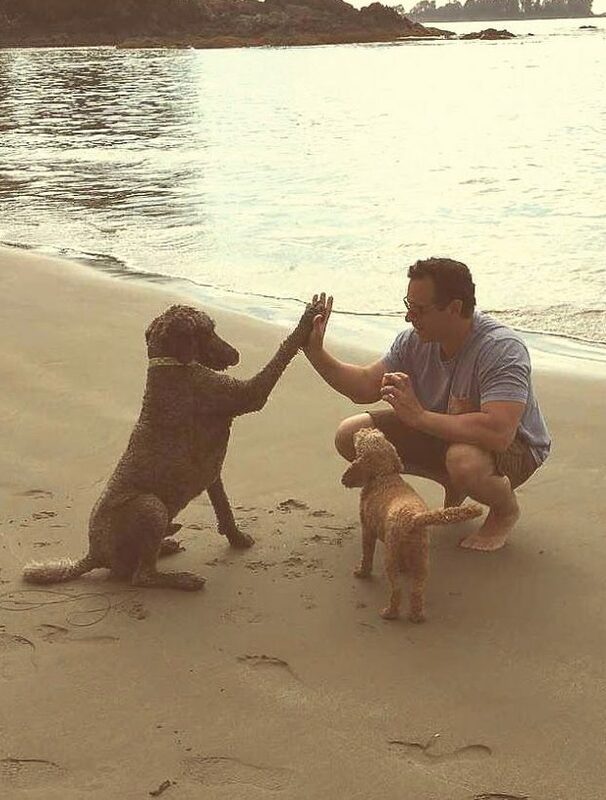 He graduated from The Ontario Veterinary College in 2000 with his Doctorate of Veterinary Medicine. Throughout his career, he has worked as an Emergency and Critical Care Veterinarian at some of the busiest emergency facilities in major cities in both the United States and Canada which include Toronto, Calgary, Edmonton, Seattle, San Jose and Huntington Beach. Through all of his experiences as a Veterinarian he has development a vast range of medical and surgical skills. Extensive searching for the right practice to call a long-term home found him purchasing Guildford Animal Hospital in 2015 with his partner, Dr. Cathy Gies. Dr. Rubenstein is excited about the opportunity to offer all aspects of veterinary care at Guildford Animal Hospital from teaching preventative care and nutrition to his clients to the compassionate care of their sick pets. He feels that pets are a true part of the family and shares his home with a Standard Poodle named Dante, a rescued black cat from the streets of San Jose named Neiman, a rescued Cockapoo from GAH named Sadie Seal and a rescued Lovebird from Calgary named Chaparral. He and Cathy are excited to offer exceptional care to all of the pets of Surrey, Langley and the surrounding areas and to call the beautiful Lower Mainland their home. Ashley, our office manager, is a vital part of Guildford Animal Hospital, having worked here since 2001. All of our clients are greeted by her at reception with a smile. Her pets are a lovable Golden Retriever named Belle (who is always smiling and wagging her tail) and a rescued Cockatiel named Iggy (who always has something to tell you). When not at work helping care for your pets she can often be found at her cabin in the interior of British Columbia, one of her favourite places in the world! 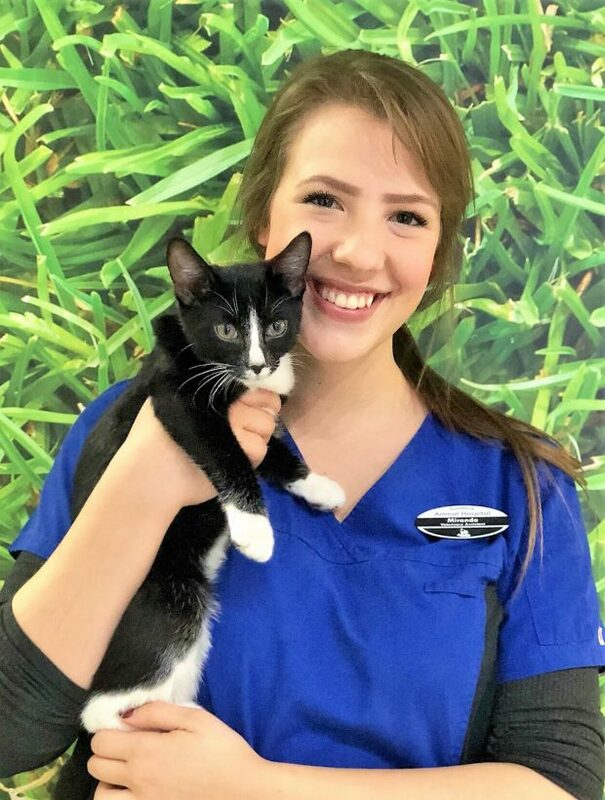 Alyssa joined us at Guildford Animal Hospital in 2015, having recently graduated from the Animal Health Technology program at Thompson Rivers University in Kamloops. She is a Registered Veterinary Technologist who is very passionate about the dental health and dietary needs of companion animals, especially when it comes to getting your pet to lose those few extra pounds. Alyssa and her husband have rescued their two pets, their cat Shadow and their dog Lola, a pit bull. She also has two other family cats, Harley and Pixie. When she's not busy at the clinic, Alyssa enjoys going to yoga classes, hiking, baking and watching movies. Tessa has always had a passion for animals and knew she wanted to work with them from a very young age. She graduated from the Animal Health Technology program at Thompson Rivers University in 2014. When not at work she also volunteers for BC and Alberta Guide dogs as a puppy raiser and boarder. In her spare time she enjoys hiking, camping, shopping, and going for ice cream. Her Fur Babies include a 5 year old ball obsessed retired guide dog named Royal, a 3 year old guide dog drop out named Princess Kelsey, and a feisty 12 year old rescue kitty, Maggie. One day she would like to add a goat to her family! Tessa's favorite aspects of veterinary medicine are Behaviour, Rehab and Surgical assisting-monitoring. She is always working to keep your pets safe and comfortable during our procedures. 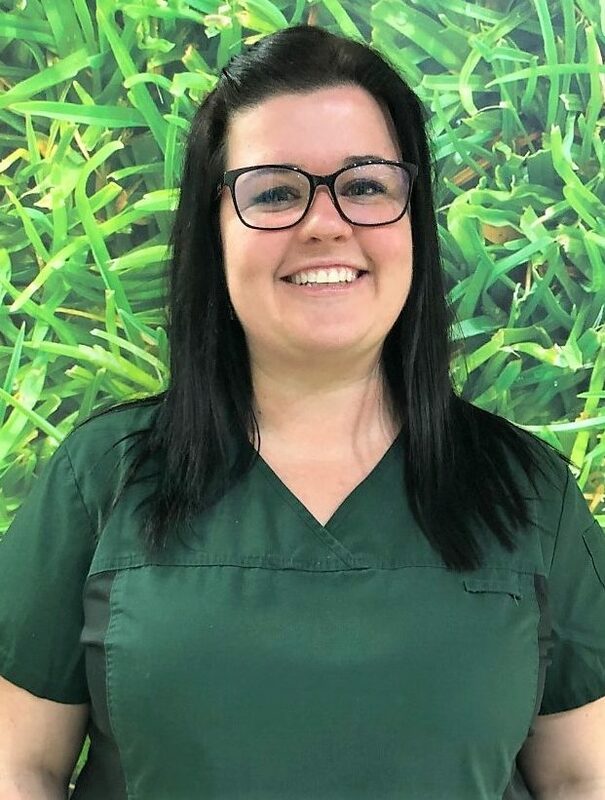 Alisha completed the Veterinary Office Assistant program at Granville Business College in 2011 and has been a member of the team at Guildford Animal Hospital since 2016. She shares her home with two cats, Stan and Serena, a rabbit named Hashbrown and two senior Guinea Pigs, Maggie and Maple. Her passions include all animals and the environment. When Alisha is not busy helping in reception, the treatment area or assisting Dr. Cathy during her examinations, she enjoys relaxing at home watching Netflix, playing video games or creating arts and crafts. She also enjoys the outdoors with her friends be it rollerblading, hiking or having adventures at the lake. Kayla’s fur family includes 2 Miniature Pinschers named King and Karma, an energetic, uncoordinated Weimaraner named Kora, and playful cat named Skylar. When she is not working, Kayla can be found hiking, running and trying new restaurants around Vancouver. Lily graduated from Douglas College with a Veterinary Office Animal Care Certificate in 2010 and has been working at Guildford ever since. Lily is a very important part of our team and enjoys making everyone laugh! Lily loves working closely with all of the pets that visit our hospital and has a knack of catering to even the most finicky of eaters among our patients. She has 1 extremely spoiled orange tabby named Alani that she loves to do everything with, including travel! In her spare time, Lily enjoys cooking, reading and spending time with loved ones. 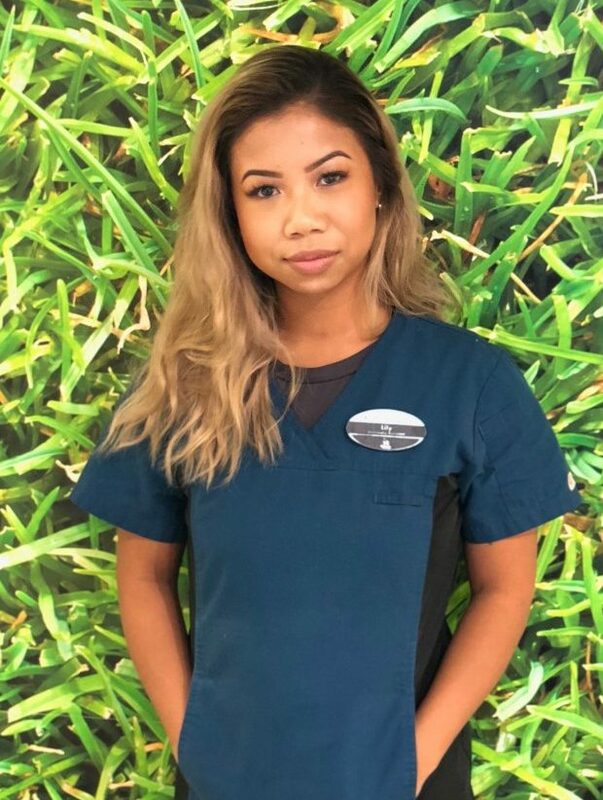 Margeory started working in the veterinary field in 2015 while attending the West Coast College VOA program. She has always had a great love and passion for animals. 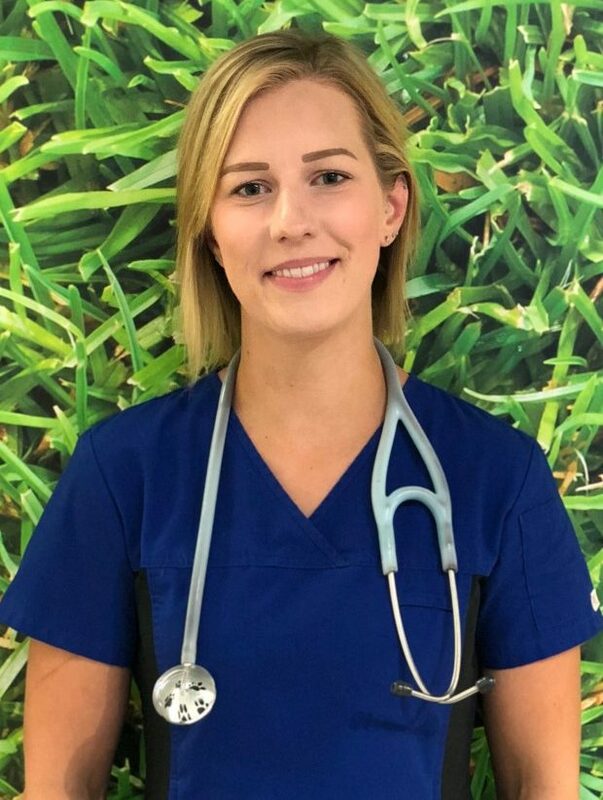 She joined the team at Guildford Animal Hospital in 2018. She shares her home with Kilo, a Shih Tzu cross that she adopted as a puppy. When not at work, Margeory enjoys spending time surrounded by friends and family and participating in many pet-related activities such as fundraising for a nonprofit shelter she started working with in 2017 called Entiende mi Silencio in Guatemala city, Central America, her original home. She is constantly helping find homes for any other pets in need within the Latin community. Being a very social person she enjoys meeting new people and utilizing her multilingual skills, so next time you see her feel free to say hello in English, French or Spanish!! Miranda graduated from Douglas College with a Veterinary Office and Animal Care Certificate in 2014. She later joined the Guildford Animal Hospital team in 2015 and has been working here ever since! You can often see her with a smile on her face greeting clients in our reception area. Miranda’s favourite part about working at Guildford Animal Hospital is meeting all the different pets that come through the door and watching their journeys unfold -- whether it be on the road to recovery or growing up. Her fur babies include a husky mix named Holly that she adopted from a rescue group on Vancouver Island, a rambunctious stray kitten named Beamer who was found hiding in a tire during a rainstorm and a spunky project horse named Ariya. When not at work Miranda loves creating new artwork, playing soccer and going on trail rides through Campbell Valley park. 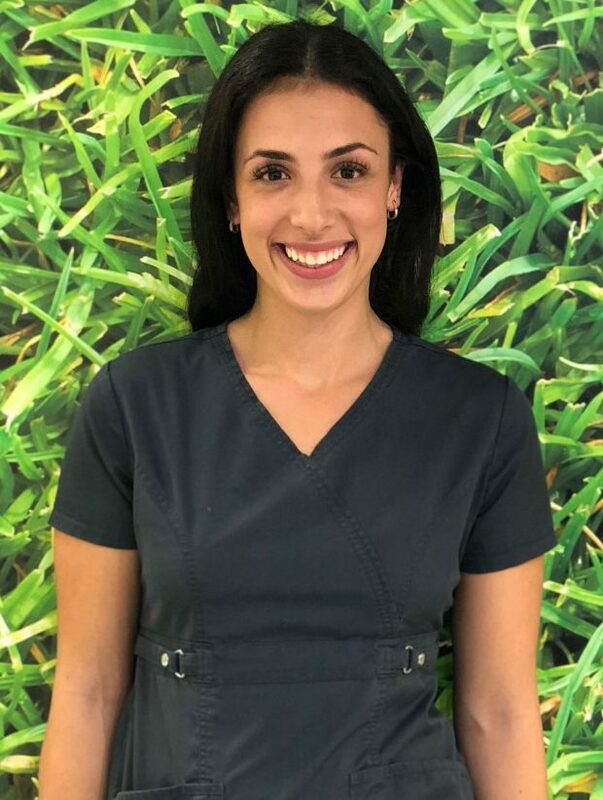 Selena started at Guildford Animal hospital in June of 2018. She has been a long time client, starting in 2001 with her bunny, Snowball. 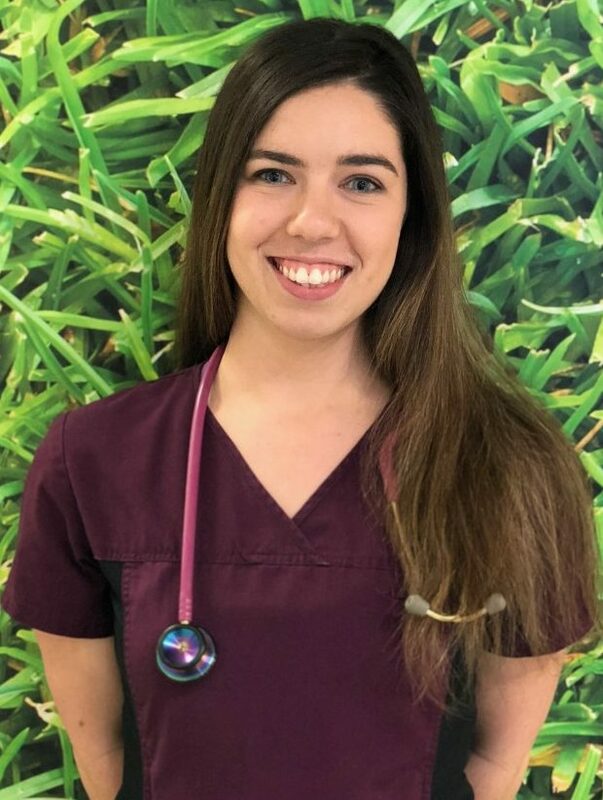 She will be pursuing her career as an RVT in 2019! Selena has always been passionate about animals and loves learning new things about Veterinary Medicine. She has 2 pets: a sock-obsessed Yorkie named Bella and a cat named Mia. In her spare time, you can find her spending time with family and enjoying the outdoors. Stephanie has been working as a Veterinary Assistant for over 9 years and has been at Guildford Animal Hospital since 2013. If she is not nursing your pets back to health or helping the vets in the exam rooms, you can find her hiking the West Coast mountains with her husband Peter, playing with her 7 nieces and nephews, dancing at a local studio, or working on anything creative. Stephanie is currently pursuing a career as a Registered Nurse, so much of her time will be taken up studying. Stephanie and Pete have a rascally cat named Pocket (though at home he only goes by “Kitten”) and a newly-adopted Border Collie named Tucker.